Chlamydia trachomatis is a gram-negative bacterial pathogen of tremendous public health concern. Ocular serovars lead to trachoma and genital serovars are the leading cause of bacterial sexually transmitted disease in developed countries. Vaccines are not available and despite the implementation of C. trachomatis screening programs, and the effectiveness of antibiotics to treat trachoma and uncomplicated sexually transmitted chlamydial infection, case rates are not declining and reinfection rates are increasing. Chlamydia are characterized by a biphasic developmental cycle that occurs exclusively in the host cell (Fig.1). Once internalized, Chlamydia reside in a membrane bound compartment, named the inclusion and alternate between an infectious form (Elementary Body, EB) and a replicative form (Reticulate Body, RB). The cycle lasts two to three days depending upon the species. If our knowledge of the cellular processes that are targeted by Chlamydia has greatly increased, we have only begun to identify the bacterial and host factors required for bacterial development. In the past, genetic intractability of Chlamydia has made it challenging to fully dissect the role of virulence factors involved in pathogenesis, but tremendous advances have recently occurred and genetic tools (transformation, mutagenesis) are emerging. We have contributed through the development of cloning vectors, the generation of Chlamydia strains expressing various fluorescent proteins (Movie 1) and a conditional gene expression system. We have also contributed to the field through the identification of host factors involved in Chlamydia infection using the RNAi methodology. One of our candidates led us to uncover that, in addition to vesicular trafficking, C. trachomatis hijacks the non-vesicular lipid transfer machinery at zone of close apposition (10-50 nm) between the ER and the inclusion membrane. These specialized platforms are referred to as ER-Inclusion membrane contact sites (MCSs) (Fig.2). Figure 2 ER – Chlamydia Inclusion Membrane Contact Sites. Part of the Chlamydia inclusion membrane makes close contact with the endoplasmic reticulum. These platforms are termed ER-Inclusion membrane contact sites. A schematic representation with the ER in green (left) and an electron micrograph (right) are shown. We have shown that the C. trachomatis type III effector protein IncD, the host lipid transfer protein CERT and the ER resident protein VAPB interact at ER-Inclusion MCSs. In addition, we have recently shown that the ER calcium sensor STIM1 co-localizes with CERT and VAPB at C. trachomatis inclusion and therefore represents a novel component of ER-Inclusion MCSs (Fig.3). Figure 3 CERT, VAP and STIM1 localize to ER-Inclusion MCS. Confocal micrograph of a Chlamydia infected HeLa cell expressing YFP-CERT (yellow), CFP-VAP (cyan) and mChSTIM1 (red). The yellow, cyan and red patches on the inclusion represent the ER-MCS. Our goal is to further characterize the structure and function of ER-Inclusion MCSs during C. trachomatis infection. Our hypothesis is that specific C. trachomatis and host factors localize to ER-Inclusion MCSs and create a specialized microenvironment that mediate the bacterial acquisition of essential nutrients, such as lipids (Fig.4). 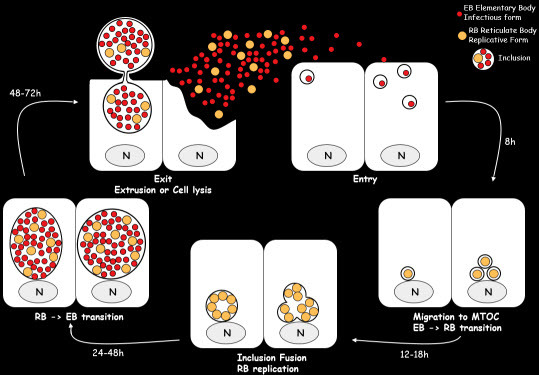 Schematic representation of bacterial and host components of ER-Inclusion MCSs. Our approach combine cell biology, molecular biology, microbiology and confocal microscopy techniques together with the newly developed genetic tools for Chlamydia. It will lead to the identification and characterization of both bacterial and host factors that localize to MCSs and therefore help us better understand the function of ER-Inclusion MCSs at the molecular level. This will further our understanding of the molecular mechanisms involved in the infection process and may reveal drug targets to facilitate the translational research development of tools to prevent, treat and control Chlamydia infection.